Herk Harvey's macabre masterpiece gained a cult following through late night television and has been a midnight movie favorite for years. 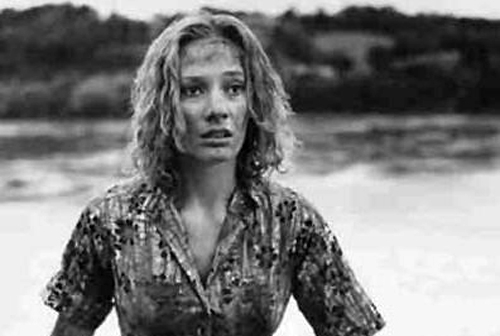 Made by industrial filmmakers on a modest budget, Carnival of Souls was intended to have the "look of a Bergman" and "feel of a Cocteau," and succeeds with its oddball locations and spooky organ score. Filmed in Lawrence, Kansas in 1962, with a really creepy Twilight Zone-style premise and some great black-and-white atmosphere. Wandering into a small town after an auto accident, to begin her new job as a church organist, young Mary Henry (Candace Hilligoss) begins to pick up strange vibes: none of the normal people in town seem to be able to see her, and she keeps being accosted by freakish pasty-faced types who seem to be dead on their feet. The nightmarish finale benefits from its one-of-a-kind "found" setting... an empty amusement park rising like a ghostly castle from the prairie landscape. This is a much less aggressive and violent film than George Romero's original Night of the Living Dead, but for sheer skin-crawling spookiness, it's in the same class.